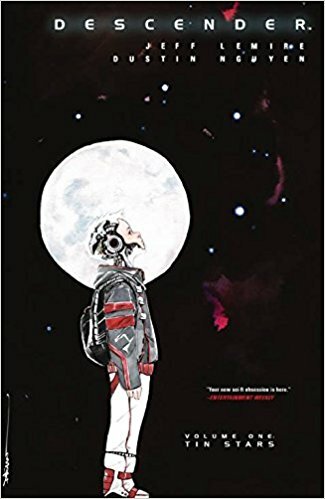 In this first volume of the critically acclaimed series, Tim-21, a robot programmed to be a child's companion, wakes up from being shut down, and finds a universe that has vastly changed. A mysterious robot attack has broken the galactic confederacy of planets apart and all robots are being hunted down and destroyed out of fear of it happening again. For Tim-21, this leads to a terrifying journey to survive attacks from bounty hunters, government agencies, and fanatics, and find out where his old master has gone. For those searching for him, Tim represents a chance to understand why the attack on humanity happened and how to stop it from happening again. This series is a must read sci-fi novel, regardless of whether you like graphic novels or not. The story is interesting, fast paced, and touching. It unfolds in a way that there are exciting revelations on a regular basis, which makes it easy to be sucked into the book. Despite how well told the story is, my favorite thing about this book was it's characters. Tim-21 acts and thinks like a child which creates a lot of emotional resonance with the reactions that he has to the hostility from other characters. He affects everyone else's behavior, for better or worse, which makes everyone's reactions to him really interesting. Overall, it is a great book, and I am excited to see where this series goes next.